Artist's impression of Fomalhaut b in orbit around its star. Back in 2008, something went bump in the night around Fomalhaut, a star in the constellation Piscis Austrinusa, 25 light-years away from Earth. Originally found by the Hubble Space Telescope, Fomalhaut b was announced as the first exoplanet (a planet outside our solar system) found through direct imaging in visible light, instead of by the usual planet-finding methods. Moving through a dusty oblong ring surrounding its star, Fomalhaut b was thought to be a planet as much as three times Jupiter’s mass, carving a path through the ring. Recent studies have taken away Fomalhaut b’s title of the first directly imaged exoplanet, and also questioned its existence. Given the varying brightness of the possible exoplanet cited in the original findings, and the inability of NASA’s Spitzer Space Telescope to find the planet in the infrared range of the electromagnetic spectrum, it was concluded that Fomalhaut b was just an apparition caused by a large clump of dust inside the star’s dusty ring. Now, thanks to a team poring through old Hubble data, Fomalhaut b has been brought back to life. Thayne Currie, an astronomer from the University of Toronto working on the data, says that while his team's findings are different, Fomalhaut b could very likely exist. Currie and his team went back through old Hubble data from 2004 and 2006, and found evidence of the planet again. This time, they called into question the earlier discovery’s report of variable brightness. Currie's team was unable to find the exoplanet using the Subaru Telescope in Hawaii; they claim that this also suggests that the planet is smaller than was originally speculated (two times Jupiter’s mass, at the most, and possibly as small as Neptune). "Although our results seriously challenge the original discovery paper, they do so in a way that actually makes the object's interpretation much cleaner and leaves intact the core conclusion, that Fomalhaut b is indeed a massive planet," said Currie in a statement. 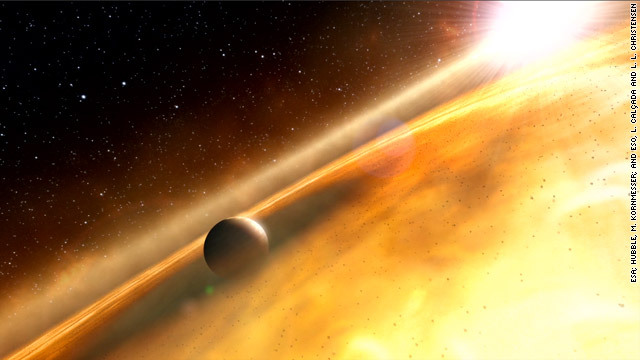 Currie told CNN Light Years that the hunt for exoplanets is still tricky, but the vast array of methods provides their own system of checks and balances. Astronomers usually use alternate techniques to find planets: They measure radial velocity (a star's wobble as a planet orbits), or they look for the transit of the planet causing an apparent dip in its host star's luminosity. Said Currie, “...No exoplanet detection method is foolproof. The methods we used to reimage Fomalhaut b and those used to image some planets...rely on very powerful but complex image processing programs to remove the noisy halo of light from the star to see the planets. It is possible, in some cases, for these programs to imperfectly remove the noise structure in such a way that what is left looks very much like a planet and is a false detection." Currie went on to say that while their study is proof that something is there, and that it is likely an exoplanet, the question of its true nature will remain a mystery for the time being. “I would say that the detection of Fomalhaut b is very solid now. But demonstrating that Fomalhaut b is an exoplanet is much harder...It is still possible that Fomalhaut b is just a dust cloud, but we think that is very unlikely." Currie hopes that NASA’s James Webb Space Telescope (JWST), which has struggled with funding over the years, will clear up some of the mystery surrounding Fomalhuat b when it is eventually launched. To announce the findings, which will be published in The Astrophysical Journal Letters, NASA Astrophysics made a spooky Halloween themed video. Check it out below. Hey, I think the crazy took my advice and went to pester footballers or rappers or something. Either that or Mom called him up from the basement for lunch. Maybe we can talk in peace now. While I realize that a reputation is a terrible thing to have at stake, researchers must realize that a snapshot of space and a discovery therein during an instance of time is NOT a constant. Things collide, and are destroyed as time passes. Let's be concerned with respect to the rest of the contents of space instead of rechecking old space bits in dust clouds. Trying to map the contents of space is like trying to map floating debris in the ocean. Get it? "Trying to map the contents of space is like trying to map floating debris in the ocean. Get it?" No, it's nothing like that. Things in space "orbit" and follow predictable paths. There is no atmosphere to provide currents. Things have mass but almost no weight. And there are no sharks and whales. Let the actual astrophysicists handle this one, ok? Actually, the moon creates the currents, not the atmosphere. Actually, Chris, the moon creates tides. Currents are... you know what, this whole thread is stupid. " Space changes over millions of years so there is no point studying it?" What a stupid argument. It's only going to go downhill bothering to argue with that kinda stupid, stupid thinking. Unless those 'bits' stop behaving like floating debris and follow a behaviour pattern indicative of a larger body, right? Thanks for your completely uneducated and meaningless post. You're a perfect example of someone who knows nothing and yet feels the need to open your mouth anyway. Thanks for removing all doubt. I cannot express in words the way this effects and affects my everyday life. On behalf of the good people of the Federation I resent the classification of Fomalhaut beta as a planet, while Pluto (Sol IX) remains not. Fomalhaut beta has mediocre hotels, average dining and no Starbucks. Pluto on the other hand has magnificent skiing slopes, lodging, and the last Starbucks before the end of the Solar System, and ever since the cootie outbreak was contained the shopping has been sooo much better! Declare Fomalhaut beta as a planet? I say nay! Nay! Give Pluto the recognition is deserves and perhaps one day we may recognize the other. Me too, I thought it was going to be Pluto. I'm dissappointed. With all of the scientific uncertainty and new discoveries why did they have to pick on poor pluto? Aw well. "why did they have to pick on poor pluto?" Pluto is the only planet discovered by an American. European astronomers have been gnashing their teeth and hating Clyde Tombaugh ever since he ground his own lenses and used a home-made scope in his back yard to find the planet. Most of the votes redefining it as a planetoid came from European astronomers. Makes more sense now, doesn't it? American's have discovered plenty that Europeans have lauded. And it's not that Europeans "had it out" for Pluto and ganged up on it, it's that Americans were too stubborn to admit that it's just a big, oblong rock. There's no reason to wax nostalgic. Pluto is a perfectly respectable planetoid, but it lacks almost all of the characteristics of a planet. We just couldn't tell that when it was first discovered. Makes sense in a backwards way..... the only reason people care about Pluto's taxonomy changing from 'planet' to 'dwarf planet' is that an American discovered it and thus it can feed into their anti-European conspiracy theory nationalism. The euros chased down the drug lord Lance Armstrong to prove their doped althetes are better than ours....euros are the ones with an inferiority complex! Dream on . . . that really is about what happened . . take that, Ugly Americans. Science is not for you. Pluto had been called a planet for over 80 years and people were accustomed to it; it was on all the sky charts and in the textbooks. It's happened before, Ceres was thought to be a new planet when it was discovered but better observation demoted it to asteroid status. Where is John Critton when ya need him? Fomalhaut b IS NOT the name of the planet. It's Name or it's inhabitants words for themselves and their planet, would not translate into anything resembling any of earth's languages. You could get close to the sound of it by perhaps telling a drunken Scotsman that the Pub is out of Lager and his mother called and said his pet Hamster named Herschel had just died after 35 years. Nearly the sound he would make when first told but not quite. The reason Fomalhaut b can't be seen is their shroud of secrecy has been in place since discovering they were being watched from the heavens. They are very shy by nature, but quite psychotic and paranoid. Makes it very hard for them to function as a society. The entire population is in lockdown and no one has eaten in weeks. I'll have the Kilgore Trout please. I'll have to check it out as I wander across space. A Scot would pay no attention to his pub being out of lager, why would he or she she drink in a tourist pub? Only tourists with no taste drink lager in Scotland. The natives drink whisky and ale. Good one! Mittens laughed about Green-grinch's plan for a moon colony, when he really planned a trip to Kolob! Darn, I was hoping it was Pluto being resurrected! Just wait, atheists will change their minds and resurrect it again, and then make it not being a planet and so on. What the heck does being an atheist have to do with the classification system for astral bodies? Seriously, does this have to be dragged down to that pointless argument? Take that crap somewhere else. Hey Bozo, there's an atheist with your girlfriend right now. other than what you read in your 'good book"? Have you ever looked through a telescope? So was I Faye. Pluto should be resurrected, should be grand-fathered in as a planet. Dump these programs and start funding more local exploration. Nobody cares about a planet we're not going to reach anytime soon. This does nothing for us in the present. Space exploration needs to be about getting people to new places. If learning about the true nature of our Universe isn't valuable, then I don't know what is......Space EXPLORATION is an entirely different subject. Other than astrophysicists who need to justify the time spent obtaining their Ph.D.'s, discovering information about the origins of the universe has absolutely no bearing on anyone's day to day life. Adding funding to space exploration programs that could provide means for people to expand their footprint in our solar system and help us escape our current resource limitations would be infinitely more valuable. Interesting take, but I disagree.....discovering and learning about the true nature of the Universe has a DIRECT effect on my understanding of my own existence and has a profound impact and bearing on my day to day life, and how I perceive my surroundings. You see, unlike Doomed, I'm still willing to learn and adapt to my new realities. Dave, your statement is completely incorrect. Studying the universe provides many practical applications to your everyday life. For example, the study of light from stars far beyond our solar system led scientists to discover new understandings of using the brightness of a star's light to measure distance. By measuring how different wavelengths in the light spectrum travel over distances, they uncovered scientific breakthroughs that translated into computer processors being able to transmit more information faster and over less bandwidth. Because the math and science they use to study the farthest corners of the universe IS transferrable, the everyday application is that your computer runs faster and allows you to send and receive information faster. If you search the Internet, you can find many different scientific breakthroughs that have resulted in enhancements to life here on Earth. Yeah you want to expand your knowledge but at a very high cost. There are people and children out there dying because they don't eat every day and the money being spent for knowing how large is the universe and how many planets there is out thee won't give these people food on the table. You're just a dreamer, adapt yourself to the real world. it may not put food on starving families tables....but neither do the 12 Lockheed Martin fighter jets that cost as much as the entire space program. With plans for 187 F-22 Raptors (the AF originally wanted 650 of them), you figure out the math. Where was that wasteful spending again? What has the Lockheed Martin fighters has to do with this, i never mention that in my post. I'm not supporting wars either. it is a big waste of money. and what does all the atheism you're so fond of mentioning have to do with it? the point is you want to talk about wasteful spending, yet there are more wasteful things than space exploration. They should get a job or quit living in the freaking desert and having 12 children. The money spent on space exploration is about a thousandth of what is spent on the US war in Afghanistan every month. If you want to get bent about money not being spent on starving people, direct it where it ought to be directed. One of our presidential candidates wants to give the military 2 trillion more dollars a year – that's more than NASA's been given over it;s entire lifetime. Science has always facinated me especial space exploration science. Exploration of outer space is what seperates us from ever other human culture before us; particularly since we have actually travelled to and touched some of the places we use to only dream about like the moon, Mars, Venus and even the outer gas giants like Saturn and Uranus. However, with crushing financial problem smashing at our door, and the very real threat of energy depletion within the few decades and ever present threat of global warming, I beliefe the millions (billions?) spent to explore outside our planet could be put to better use – securing our future and the futures of our children! Once those home bound issues have been solved then we can return our gaze to the star and planet beyong out earthly reach!
" people and children out there dying because they don't eat every day and the money being spent for knowing how large is the universe and how many planets there is out thee won't give these people food on the table." What's your point? Money spent on football games and rap records doesn't go to feed the hungry, either. Go bother them for a while. Gil, every dime was spent right here on Earth. "discovering information about the origins of the universe has absolutely no bearing on anyone's day to day life." "Pure Research" nearly always pays off in the end. The things you find along the way are often more valuable than the original goal. Atheists and their sciences, the planet exist oh sorry the plane doesn't exist, sorry again we were wrong the planet does exist. Bunch of blind sheep. Riiiight, because your belief that "truth" lies in a 2000 year old myth created by man for the purpose of controlling man is "seeing".....you're the one who is blind. At least i don't keep changing my story all the the time unlike you atheists, you just can't keep your story straight. You're the one who's blind. That's because we're not telling a "story".....lol. You don't keep changing your story, you just can't make up your mind which story you are going to go with. We don't blindly follow some story from the bronze age, that's why we sometimes have to change our minds. Unlike yours, our story must change as more information becomes available through scientific research, and direct observations like this. Your story never changes, must follow ancient fairy tale book, it is the WORD OF GOD! Who is blind, you or me? "i don't keep changing my story all the the time unlike you atheists, you just can't keep your story straight." Right, so make up your mind if it's Allah, Buddha, or Jehovah who made the world. Some of you believers say one thing, and some say the other. At least science keeps striving to learn and progress......can you imagine what would happen if Christians put the bible through the same process of discovery.......or even just applied common sense?.....sheep indeed. Same thing as a story, you just can't keep you facts straight. lol,,,How many kids do you have? answer: i have 3 kids, no wait i have 4, sorry i got it all wrong i have 2 kids, no wait i will have to call my atheist friend, he will remind me. Another Atheist tell someone: turn left, no right, sorry left, too late it was right. I call that a bunch of idiots who can't make up their minds. It's not changing the story, it's called learning and progress......Science continues to test it's theories and thus, those thories must EVOLVE....scary word, huh? It must be nice to know the answers before even asking a question....."All I know is the story..question the story? Why would I do that?" Isn't that how you operate? The lunatics are in my hall . . .
At least i don't live in my parents basement and having them paying for college so i can sit my lazy behind and day dreaming all day. I work for a living and i have a family to support Some others are not as fortunate as i am, some are losing their homes because they got laid from their jobs Some are working 2 or 3 jobs a day to pay and support you bunch of dreamers. You guys are having your heads in the clouds and looking for a Nobel Prize to attach to your wall and show your friends around, which in reality is just a piece of woods and bronze. Oh, knock it off you arrogant a$$. Isn't one of your God's requirements that you be humble? Stop acting like you know it all or you are no better than anyone else you are harping about. Besides, Christianity has most certainly changed its 'story' over the years -Flat earth, center of the universe, etc. It's OK to admit you are not perfect, after all – you are not God, right? Do you like living in your parents basement and having them paying for everything you want? Is this why you're mad at me? Is the only reason why you're argument is "getting everything we want from our mothers basement" is because you have no good argument besides saying we change our minds? I'm surprised you can figure out how to work a computer, considering you obviously don't like advancement and expanding your intelligence. I'm not about to knock on you for believing in a god, because if it makes you sleep at night that's fine. But use your common sense and realize that your argument of "changing our mind" isn't because "we" are athiests. It's because we're not sure. Just because the Bible is so sure of itself doesn't mean we need to be. Why, when someone makes a tongue-in-cheek comment about religion or lack of it does everyone get their hackles up? Ease up a bit, if you're religious say a prayer for the other guy or gal, if you're not then have a happy thought and wish the joker the best. Your personal beliefs are (or should be) strong enough to stand up to the occasional joker. If any of you out there want to fight, then choose a tougher opponent, like poverty, child abuse, cancer, or something worth fighting against. Dreadfully sorry you have no interest in furthering your education, that you're completely satisfied with the drudgery you call your "life", your never-ending misery chained to ancient mythology. Living in my mother's basement while I pursue my education? She's a good 800 miles away, and I'm also working two jobs while attending school full-time, at 42, so you can cram your ersatz martyrdom and put your ignoramus hair-shirt away. The only person who gives a rat's patoot about your "suffering" is you. I'd hazard a guess that the only thing stopping you from going to college is the placement test – most don't offer classes that low.
" I work for a living and i have a family to support " I doubt it; you have the emotional maturity of a teenager. You're some kid whose parents couldn't send hm to school, and you hate those of us who had the opportunity. You have come here to sneer at something you aren't educated enough to understand, and you have demonstrated that you lack a grasp of basic science; about tenth grade? Ninth? Take heart, kid, school will end one day.
" Isn't one of your God's requirements that you be humble? " What, him a Christian? He's just mental. Probably thinks God is being paid for by his taxes. Just because one majors/studies sciences doesn't automatically make one an Athiest. Get your facts straight and stop stereotyping. Sciences are important and so is research without the the research we have YOU wouldn't have the flipping Internet or technology that you have at the touch of your fingers. i know you are just a troll and all doomed but what does atheism have to do with this story? "what does atheism have to do with this story?" An atheist once stole his girlfriend or kicked his dog or something. Who knows what makes these guys fixate on stuff? There's one who just endlessly repeats "prayer changes things," and one who howls insanely against Hindus. This one's brainbug is to insult unbelievers in Jesus' name Amen world without end. Go into any public library and you'll see them sitting there typing this stuff. "Atheists and their sciences" New things used to be applauded by Christians because they revealed new aspects of God's infinite creation. Today we have clods who disbelieve in the computers they type on. Dear God, why can't you get good help these days? Do you not pay enough or something? "Something is there, it is likely an exoplanet, the question of its true nature will remain a mystery for the time being." Just the fact that this "something" is 25 light years away from Earth and we can detect it, is amazing – at least to me – in by itself. However, since NASA’s Spitzer Space Telescope is unable to find said exoplanet in the infrared range of the electromagnetic spectrum, I am going to guess it is a giant KlingOn ship hiding its infrared signature, trying to avoid detection. Now if they would just re-analyze the data from the Bible, perhaps they can get something interesting out of that! You just HAD to bring up the bible up, didn't you? Thanks for the health tip, "Doomed." I'll get my Bible out and do some excorcise. I really have gotten out of shape. Now I need some instruction on how best to use it. And pulease! Keep it clean. What so-called "data" are you referring to? Do you comprehend the meaning of the term, "data" ???? William Miller was able to analyze Bible data and prove that the world was going to end in 1836. If the planet can no longer be found, maybe it was destroyed by the fully armed and operational Death Star circa 1983. Just a thought. Surprised this isn't another story about Mars and it's hot rod dune buggy. I thought it was about Pluto, regaining it's former glory. "doomed": nice name for yourself and appropriate with your way of thinking. You're able to write on this blog because dreamers with a strong science and engineering background did useful things. Ideas are Darwinian and the best lead to the future. Whiners and complainers die out. How cool! Amazing that the data from 2004-2006 can be evaluated and something interesting come of it!